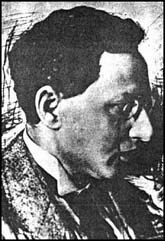 The son of Jewish parents, Uritsky was born in the Ukraine, Russia, in 1873. He studied law at Kiev University and graduated in 1897. As a student he joined the Social Democratic Party. At the Second Congress of the Social Democratic Party in London in 1903, Uritsky supported Julius Martov and joined the Mensheviks. After the February Revolution, Uritsky and Trotsky both left the Mensheviks and joined the Bolsheviks. He took part in the October Revolution and agreed with the suppression of the Constituent Assembly. In March, 1918, Uritsky he joined the Communist Secret Police (Cheka) and was appointed Commissar for Internal Affairs in the Northern Region. He was assassinated by a young student on 30th August, 1918. His death resulted in what became known as the Red Terror. See Silhouette of Moisei Uritsky by Lunacharsky.